Footage posted on YouTube that appears to show a glowing orb of light hovering over the Jerusalem’s iconic Dome of the Rock led the more excitable tabloids to proclaim the “final proof that aliens exist” had arrived. But seasoned UFO footage watchers smelled a rat. In his caption the photographer claimed he and another man “witnessed an amazing ufo aircraft over Jerusalem old city” from a panoramic viewpoint near Mount Zion in the early hours of 28 January. The dramatic footage shows the ‘UFO’ descending slowly to ground level where it hovers for a short time. 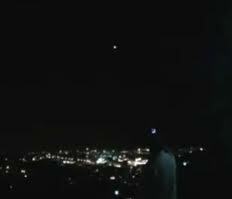 In one clip a group of American tourists can be heard saying: ‘We’ve seen them in Mississippi like this’, while others gasp in astonishment as the UFO zooms upwards into the sky.Two more mobile phone clips were added later, uploaded (it was claimed), by groups of independent witnesses who saw the same spectacular event from different parts of the city. The rock is the site where Muslims believe Muhammed ascended to heaven with the angel Gabriel and the foundation stone is the holiest site in Judaism. Within hours the images went viral and the net was buzzing with possibilities: was this proof that aliens are visiting our holy sites? Was it a visit from an angel, a signal from the Hebrew god or “a great deception sent by Satan”? Or was it all just the latest hoax created by the UFO footage cottage industry to fool a credulous media and public? This entry was posted in Uncategorized and tagged CGI, hoax, UFOs. Bookmark the permalink.